At the top of our client's bucket list: Taking a modded-out 1960s FJ45LV up and down the Southern California Coast with his friends, in search of the area's best sand and surf. Our mission: create the ultimate surf wagon — one that preserves the classic good looks of the FJ45LV, and is equipped with our Signature interior and mechanical components. Our client's parting request - "Oh, and please keep it Toyota." Our sentiments exactly. 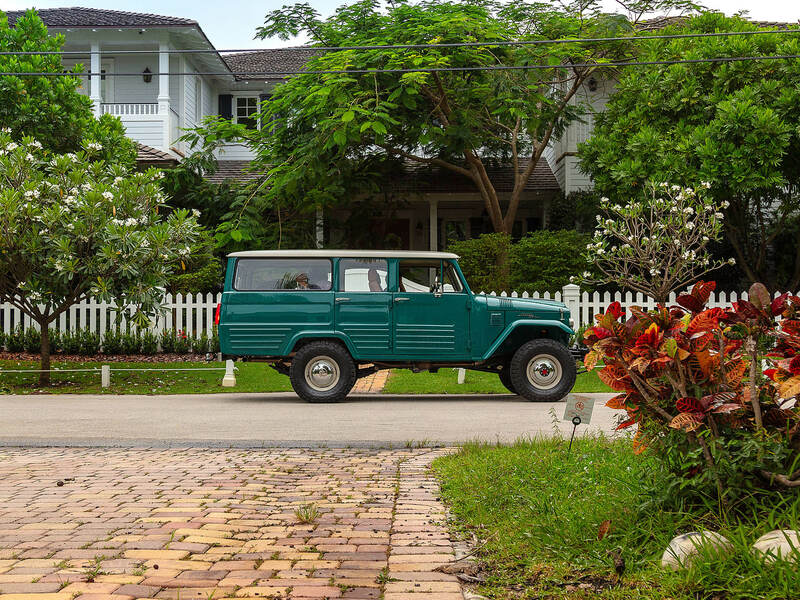 Character is something that comes standard with the FJ45LV — its grooved side panels and unique rear overhang, are a product of Gifu Body Co. Ltd., a coach-builder once associated with Toyota. It’s a unique body that's 100% vintage Toyota, and one that feels right home in Southern California. But this “wagon” isn't woody or VW microbus. It's a Land Cruiser, and a rare one at that. Of the 5,080 that were made, only about a 1,000 were shipped to the States. Yet, here it is, perfected and repainted, its original sheet metal outfitted with 31” All-Terrain tires and chrome hubcaps. It’s the ultimate remake of an iconic machine. Open the hood of this FJ45LV, and you'll discover a Toyota 1GR-FE engine - a fuel-injected 4.0L V6 powerhouse that generates an estimated 240 hp. It’s the perfect engine for extra long road trips and prolonged searches for epic waves. This powerhouse is complemented by a smooth-shifting Toyota 5-speed manual, four-wheel disc brakes, our Advanced Power Steering system, and Old Man Emu shocks and leaf springs. All-in-all, this is one powerful, smooth-riding beach cruiser. Other custom mechanical features include a stainless steel exhaust system, custom fuel system and cooling system, and more. The cabin of this FJ45LV is versatile enough to haul a couple of boards and durable enough to weather the occasional sea spray or sand flurry. Custom brown CocoMats® line the floors and contrast beautifully with the brown vinyl interior trim. Up front, we chose RECARO® Specialist seats, which keep things comfortable, without excessive modern contours. For rear seating, we repurposed the original bench to produce stand-alone bucket seats that fold down, making way for lots of gear. The custom rear center console can also be removed to run surfboards through the cabin. One of our favorite interior features is the dash. To preserve the simple utilitarian approach of the FJ45LV, we kept the dash free of modern stereo equipment and laid-out essential functions with custom pull knobs designed in-house and CNC-machined in aluminum to match the original knobs of the 60’s Land Cruiser. VintageAir® air vents were integrated into the dash, keeping the glove box fully functional. More modern accessories are integrated into the front center console, keeping those all-important creature comforts within reach. A marine-grade JL Audio MediaMaster® receiver controls the premium sound system, composed of JL Audio component speakers, JL Audio amplifier, and a 10” subwoofer integrated into the rear cargo space. This Land Cruiser isn’t just ready for a good time, it’s fully equipped to out-party you. Ready to Ride the FJ45LV Wave? Get in touch with our team, and let’s get to work on your dream Signature rig!